This is the NW Premiere of this show by Steve Tomlinson and directed and designed by Don Horn (Triangle’s co-founder and Managing Director). It is a one-man show starring Gary Wayne Cash and plays at Triangle’s space at 1785 NE Sandy Blvd. The wonderful collection of Fiesta-wear is donated from the estate of Joan Hayward. For more information go to www.tripro.org or call 503-239-5919. 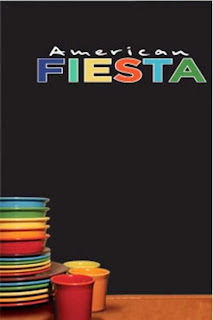 And if you have any of the Fiesta collection, I’m sure Don would appreciate seeing photos of them. 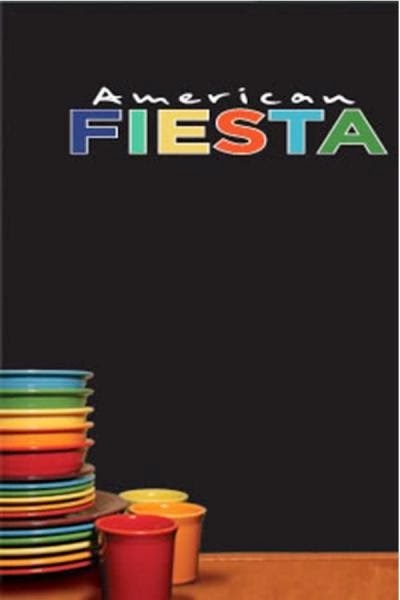 The Fiesta collection of dish-wear was begun by Homer Laughlin back East, during the depression of the 1930’s. He felt that people needed a little color in their drab lives during this period of time. Also one could buy a piece of one type and another piece of another color or style and it would all fit together. No more the expense of having to buy complete sets of matching dishes. The vibrant colors might evoke visions of a lovely rainbow, a jumbled kaleidoscope or the terror-warning alert ladder. It’s all there, just depends on your perspective. Interpretation is in “the eye of the beholder.” Kind of like life, isn’t it? And, maybe, that’s part of the point of the play. Colorful, solid, reliable, individualistic, durable—a bit of Americana rolled into one. A reflection of the Past attempting to fuse onto the Future, voicing the need for both. The tale follows the story of Steven based, I’m sure, on much of the author’s life. He tells of his childhood in Oklahoma with the typical father/mother of the times. The father, ruler of the roost….the mother, following behind as best she can. And the son, sensing he’s different…discovering he’s gay. Eventually finding a lover, a partner, a mate in Leon and wanting to get married. But, at the time, only Canada, in North America, would recognize such a union. There are other issues at stake here, too, such as the rights of a person’s partner to make decisions if the other partner is unable to, equal rights in job opportunities and education, et. al. And, a lesson he learns at a convention of Fiesta-wear collectors is that nobody is perfect. A blind lady has a near-complete collection of this table-wear. But he informs her that many of the pieces have cracks and chips in them. To her, these are not flaws but reflect individual, personal passions/traumas of the moment that caused them. We all are like that…different colors & sizes, damaged, but all part of the same world, so its best that we try to get along. Cash not only plays the main character, but voices others as well, including Leon, his parents, collectors and shop-owners, etc. It is a 90 minute monologue and very well done. This role could have been over-acted and the alternate characters been larger. But Cash does the unusual and underplays the role, pulling his characters closer to his breast. This method gives more of a personal feel for the character from the audience’s perspective. As if he were just sitting across from you and telling stories of his life, much like Bill Cosby use to do. More like a storyteller than our traditional view of an actor on stage. It is very effective. The collection of fiesta-wear is quite amazing and, I’m sure, Don would have no trouble telling you about it. And his direction of the play, as always, seems to blend his own views onto the subject and vice versa, so that you get a very personal look into life and art, not an easy marriage to conceive because it makes the artist vulnerable. It is a brave thing to do but, after repeated exposure to his plays, it is a satisfying one, from my humble opinion. A celebration…a fiesta of life that speaks to all of us. This classic musical is based on the film by the same name, written by Hugh Martin, Ralph Blane and Hugh Wheeler which, in turn, is based on “The Kensington Stories” by Sally Benson. It is directed by Elizabeth Pullen and Ken Moore, choreography by Stephanie Belt-Verhoef and piano accompaniment by Brynn Hurdus. 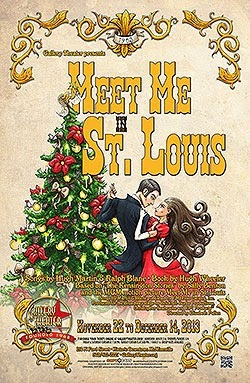 It is playing at their location at 210 NE Ford St. in McMinnville through December 14th. For further information, go to www.gallerytheater.org. This play is based on the terrific MGM musical directed by Vincent Minnelli (Liza’s father) and starring Judy Garland and Margeret O’Brien. It has some now known standard songs such as, “Skip to the Lou,” “Under the Bamboo Tree,” the “Trolley Song,” “The First Noel,” “Have Yourself a Merry Little Christmas,” and, of course, the title song. It is the story of the Smith family of Missouri from about the summer of 1903 through the Spring of 1904, the World’s Fair. The Gallery Theater is a community-oriented theatre for 45 years in a close-knit town, so it seems fitting that this play, with old-fashioned family values, should be presented here. One can wax-nostalgic as this mid-west family takes us on a brief tour of what life was like without cell phones, cable TV, computers, smog, gangs and jets. Instead, there was ice-cream socials, bandstands, trolleys, soda fountains, community dances and actual one-on-one human contact with each other. Forced to choose between the two, I opt for the latter. The story follows the adventures of the Smith family. The parents are Alonzo (Dave Ferry) and his wife, Anna (Kelly Ashton). The two oldest sibs are Rose (Jamie Corff), looking for a possible beau in Warren (Justin Jenks) and Lon (Caleb Janzen), going off to college at Princeton. Esther (Jordan Ferry) is in high school but find her possible mate in the boy-next-door, John (Ethan Keleher). Agnes (Makayla Norwood) is still in grammar school, and the youngest, and most impish, is Tootie (Zoe Corff). To round out the household is the somewhat eccentric Grandpa (Don Myatt) and the outspoken, Irish maid, Katie (Alice Darnton). The family has its ups and downs but there is obviously a lot of love encompassing this clan. It follows seasonally their lives through Independence Day, Halloween, Thanksgiving, Christmas and, finally, the World’s Fair of 1904. It peeks in on the flirtations of Esther and John, the long-distant romance, of Rose and Warren, the eccentricities of the non-conforming Grandfather and the devilish escapades of Tootie and Agnes. But the major stumbling block the family encounters during this period, is the fact that the father has been offered a promotion in the firm but they will be forced to move to New York City and, probably, a more progressive lifestyle for all of them. But, like such classics of the time, such as, I Remember Mama, Life With Father and The Music Man, there was no real mystery of how things would turn out. The tried-and-true ways of love and family will prevail and happily-ever-after is still in vogue as an ending. Everlasting is truly…everlasting. Both Dave Ferry and Ashton as the parents are in fine voice and convincing. Janzen, as the affable son, has an easy manner in his songs and dancing. As the youngest members of the tribe, Norwood and Zoe Corff are appropriately impish in their performances. And there is a nice, comic turn by Colton Price as he plays three misfit schoolboys, one after another. And Kira Weaver is a fine dancer and singer and shines in the chorus. The standouts for me, though, were Jamie Corff as Rose. She is an attractive, young lady and handles both singing and acting chores with confidence. Darnton, as the feisty maid, added brashness and charm to the proceedings and is also in good voice. And Hurdus, as the pianist, is amazing, tackling this difficult score by herself. It’s refreshing to see actual teenagers play the roles of Esther (Jordan Ferry) and John (Keleher). The awkwardness and angst of those teen years shows through. But, also, as young performers, the inexperience shows through at time, too. Ferry is a bit unsure of herself sometimes but has the look and feel for the role. But, Keleher, in particular, seems stiff and, at times, and speaks in monotones, as he portrays his character. But with such a supportive group in this theatre, I’m sure they will both blossom as performers in years to come. And the costumes by Antonia Osterhout are outstanding. The vibrant colors and styles of the period are beautifully represented here. The set design by Moore is amazing and has a terrific trolley in a key scene. The World’s Fair skyline is a wonderful ending to the show. One would think we are indeed transported back in time (reserve a space for me). The direction by Moore and Pullen fits this group nicely, giving us the warmth of the era, and, obviously, reflected by the love of it from the cast. I would recommend this show, especially as a gift for the whole family, during this holiday period. And may we all find that lazy pace and “…Huckleberry friend…” within this modern age. If you do go, please tell them Dennis sent you. This is considered one of the great classics of literature, ranked alongside Huckleberry Finn and Gone With The Wind, as depictions of the South by Southern writers. The Award-winning movie is also considered one of the great films of all time. Lee won all sorts of accolades for her book and was a chief researcher on Truman Capote’s expose’, In Cold Blood. But she, herself, never wrote another book and shunned publicity (as did Mitchell with GWTW). I directed a production of the play myself and reviewed OSF’s fine production a couple seasons ago (check it out elsewhere in this blog). The story is based on true memories of Lee as a child in the Deep South, Macon, Alabama, of the mid-thirties. The story is narrated through her eyes as an adult, Jean Louise Fitch (Bronwyn Richard). 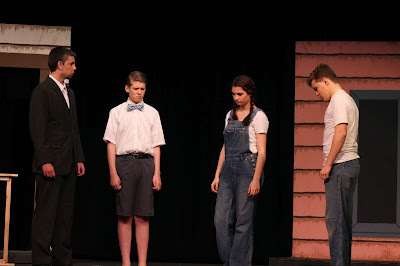 In the play, she is the child, Scout (Bailey Baxter) and with her older brother, Jem (Markus King), and their neighbor (in actual fact, Truman Capote) Dill (Brendan Groat), they search out the secrets of life. And their main adult anchor in this journey is her father, the lawyer, Atticus Fitch (Clifford Armstrong). Atticus is asked to defend a black man, Tom Robinson (Devin Johnson-Burch) for an alleged abuse on a white girl, Mayella Ewell (Sarah Russell). Her father, Bob Ewell (Anthony Barnes), claims he saw Tom beating her. The outcome is predetermined, as this is the Deep South of the 1930’s. But the trial takes up a major portion of the play and we see the true make-up of the townsfolk through the eyes of wondering youth. Although justice may not have been accomplished for Tom, it does have a strange way of working, in ironic ways, toward punishing evil, awakening awareness in a town and giving hope for a potential brave, new world of the future. In this little corner of earth, in a dreary niche of time, eyes are opened, fair maidens are saved, dragons are dispelled, and a people may live, if not happily, then hopefully, ever after. The focus of the story is the three young people, and they are super. Baxter’s Scout is articulate, lively, and very believable. King’s Jem is an explosion onstage, very animated and vocal is his portrayal. And Groat’s Dill fits into the trio nicely as the most refined of the group. Armstrong as Atticus has the look and sound of the reserved lawyer and does well in his summation to the jury. But I had wished he’d loosen up a bit, so we see more of the loving father and emotional side of the character. And Kira Wirt as the nanny, Calpurnia, presents us with thoughtful and assertive character and does it convincingly. Johnson-Burch as Tom comes across very well in the trial scene, giving the audience a simple but very articulate and good man. Richard, as the adult Scout, does an admirable job, having just gotten the role a week before. She has the right look for the character and the reading of the lines actually enhances the role. But she needs to articulate more at times and slow down, as her part of the story is very important. A couple of gems in small roles are Emily Pulley as Mrs. DuBois. Both her acting and the make-up are quite effective as a very senior citizen. Karlly Palica as Maudie, a neighbor, delivers well a powerful speech toward the end about the hope for the future. And Barnes gives a nicely, sinister performance as the despicable, Bob Ewell. But the diamond in the rough and the most powerful single performance/scene is Ms. Russell as Mayella. She is spot on in her examination scene in the trial. The stage catches fire with her explosive, manic portrayal of this complex character, showing vulnerability, naivety, pain, and spit and fire in her few moments onstage. And she is equally animated when she is sitting in the courtroom, watching the proceedings. A talent to be watch in future endeavors! Some suggestions I would offer are that the director may consider giving the narrator a mike, as some of the set changes are noisy enough to drown her out. Also, the set changes, although swiftly done, probably could be reduced with some more inventive staging. And a general note, the cast, as a whole, needs to slow down a bit more and watch enunciations/articulation. They can actually be heard quite well, it’s just the understandability, at times, with some characters, that is messy. I recommend this production but, be warned, it is about adult subject matter and uses the “n” word often. If you do go, please tell them Dennis sent you.